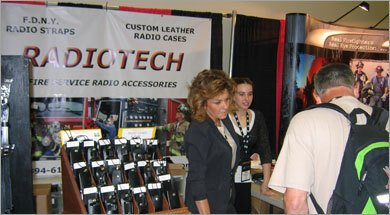 RadioTech is a family owned and operated business with offices and manufacturing operations in the Northeast. Our team includes Motorola sales and service personnel with more than 38 years of experience, as well as individuals dedicated to Fire Service Accessories sales and customer service. Each member of our team is trained to know both our accessory products and the radios used with those products, and they take pride in their ability to help you, our customer find the right product for your unique situation. When you call us, whether for sales or service, you will be speaking with a person who is dedicated to serving our customers in the best way possible. We believe in accountability and responsibility and every member of our team will take the time needed to ensure that your order is handled professionally and shipped correctly and quickly, in that order. RadioTech is proud to employ Americans in the creation, sale and service for products used by America’s bravest men and women. From our designers and fabricators to our sales and customer service personnel, you can feel good about supporting a company that keeps jobs local and bolsters the national economy. We believe in the quality of American-made products and stand behind each of our products with replacement guarantees. We believe in running our business the old fashioned way. We answer every phone call and email personally, and address all items or issues of concern. We will never leave you hanging for an answer, but we will always provide the right answer, even if it takes time to research. We know that the equipment we provide is used in life-saving efforts by the bravest of people, and we would not want these American heroes to have anything less than the best we can provide. Every member of our team is committed to providing you with the quality of workmanship that you need to save lives and keep American families and businesses safe. Today, more than 22 years since our establishment, we still consider ourselves a family business. From our sales and marketing staff to product designers and fabricators, we work so closely with our team, they are a part of our family. We are proud to have these fine people who care about our customers, business and products representing our name across the United States.